The market for large solar systems for district heating has been growing very fast the last 5 years - in 2016 more than 500 000 m² (350 MW) was installed - and perspectives are good for the comming years althoug only less thah 50 000 m² was installed in 2017. The market for individual systems has been on a low level approx. 5 - 10 MW/year the last 5 years - with a tendency to a decreasing market. For the large systems for district heating the main market drivers are the relatively low and stable solar heat price. Heat from large solar fields is competitive with heat price of gas and some kinds of biomass. The small systems are not as competitive as the large systems - and during the last years people seem much more interested in PV systems. The estimated employment related to the production and installation of solar heating systems in the record year 2016 is approximately 1300 full time jobs. [according to calculation method given in Fakta om Solvarme, faktablad G07]. On average it would be 500 - 600. Small domestic hot water system for individual houses, 4 m² collector: 3 500 € including 25% VAT. The price is the additional price to install a solar water heater instead of a conventional water heater. [Fakta om Solvarme, faktablad G09a]. Medium size hot water system for (e.g., institutions) 100 m² collector: 42 000 € (420 €/m²) excluding VAT. The price is the additional price to install a solar water heater instead of a conventional water heater. [Fakta om Solvarme, faktablad G09a]. EUDP is a general support programme for new and effective energy technologies - annual budget 2018 is 400 mio DKK. The innovative trend right now in Denmark is large scale solar district heating systems (up to 150 000 m²) with seasonal storage (up to 200 000 m3) - and in some cases combined with large heat pumps. The long-term goal for Danish energy policy is clear: the entire energy supply – electricity, heating, industry and transport – is to be covered by renewable energy by 2050. In March 2012 a historic new Energy Agreement was reached in Denmark. The Agreement contains a wide range of ambitious initiatives, bringing Denmark a good step closer to the target of 100% renewable energy in the energy and transport sectors by 2050. 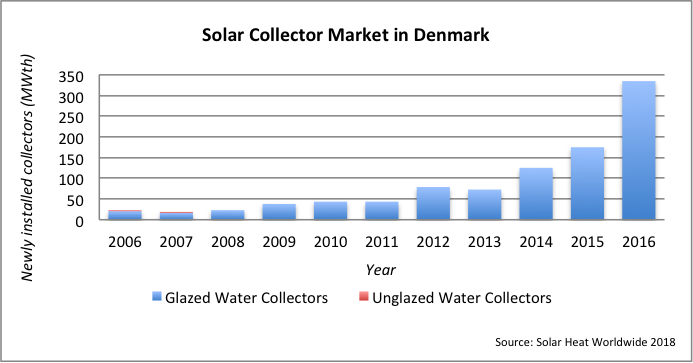 At the moment there is no national solar thermal association in Denmark.